boágus [b?g?ss] adjective 1. fake or deceitful: false, dishonest, or fraudulently imitating something 2. bad or useless: not good, pleasant, or acceptable (slang) [Early 19th century. 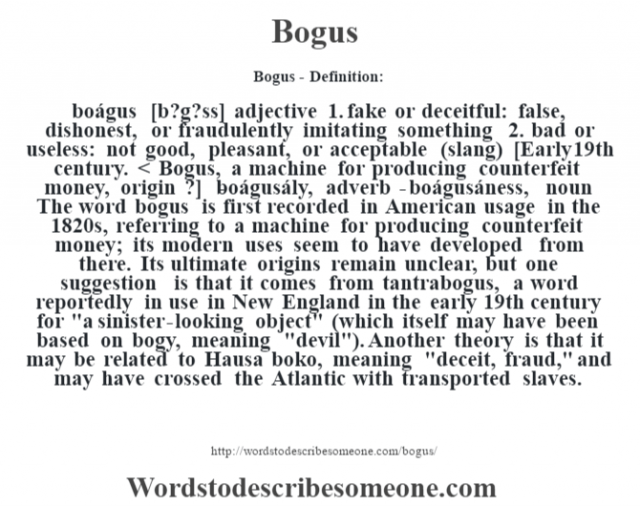 < Bogus, a machine for producing counterfeit money, origin ?] -boágusály, adverb -boágusáness, noun The word bogus is first recorded in American usage in the 1820s, referring to a machine for producing counterfeit money; its modern uses seem to have developed from there. Its ultimate origins remain unclear, but one suggestion is that it comes from tantrabogus, a word reportedly in use in New England in the early 19th century for "a sinister-looking object" (which itself may have been based on bogy, meaning "devil"). Another theory is that it may be related to Hausa boko, meaning "deceit, fraud," and may have crossed the Atlantic with transported slaves.